Beach Trips with the Kids! 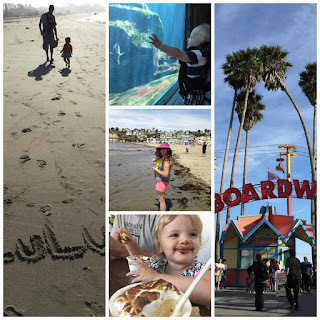 | The House of Martins The House of Martins: Beach Trips with the Kids! Beach Trips with the Kids! One of my summer bucket list items was taking the kids to the beach - and we've now done that a few times. Here is a bit about my experience with the kids in Santa Cruz and Lake Tahoe. For Santa Cruz - I was fortunate enough to have a "work week" where I could get all my work done from anywhere with an internet connection. I used Airbnb to book a last minute condo in Santa Cruz - just blocks from the Boardwalk. We took advantage of Gus' morning nap time one day and drove to the Monterey Bay Aquarium. Neither my husband nor I had been their since we were kids - and we were both amazed. The kids seemed to love it too. We ate lunch at The Fish Hopper right near by. The food was great, we had a great view - it was pricey - but good. Since our kiddos are little - we only walked around the Boardwalk a little bit - and we only rode on the carousel. We took a trip in to the downtown area for ice cream at The Penny Ice Creamery. This could have been my highlight of the trip. Maybe Lucille's too. If you go - you should try the toasted marshmallow topping. AMAZING. We spent two days at Capitola - which beach-wise is way more our speed. We had a great time - the kids enjoyed the beach - and Gus loved to get his toes wet and watch the waves come in and go out. In Capitola we ate at both Zelda and Bay Bar & Grill. My Mahi-Mahi Sandwich at Bay Bar & Grill was the best thing I ate during the whole trip (other than the ice cream!) And I got some work done at Mr. Toots Coffeehouse. We also had ice cream here - at Village Grill and Creamery. It was a great trip. We also recently did a day trip to Lake Tahoe. We literally just took off one day when the kids both woke up super early. Gus napped most of the way there - and we stopped at El Dorado Beach - pretty much the first beach you hit when your drive to the south side of the lake. I think Lucille liked the lake water better than the ocean. It didn't move and it was warm. More my style as well. We had an amazing patio lunch at Artemis Mediterranean Grill. Being greek, I think I'm picky about greek food... and this was great. Lucille loved her chicken kabob - and the Artemis fries were delish. For my Northern California readers - any other beach trip recommendations? Lake or ocean? We love Dillon Beach and will probably try to fit that in too. If you are interested in trying Airbnb - use this link to get a $25 credit! My experience was perfect!